Have you seen an attractive lady with a winning smile and a charming foreign accent? Then you have seen Gunilla Dorsen, a newcomer who is delighted to be a Plymouth Harbor resident. Gunilla was born in Lidingö, Sweden, a community outside of Stockholm, which accounts for her charming accent. She was the youngest of four children; her father was a professor of industrial economics and management, a position which caused them to move to Bergen, Norway, where Gunilla started school. However, when the Germans invaded, they were able to escape to Sweden where Gunilla had to start school all over. Gunilla finished her education in Sweden and took secretarial and business courses. After a stint working for her father, she worked for the Swedish Foreign Service in San Francisco and then as a press assistant in Washington, D.C., and in Copenhagen. It was in Washington, D.C., where she met Dr. Robert Dorsen, who was working with the Johnson Administration on family planning. He was sent to India, and she was stationed in Copenhagen. But fate decreed they were not to be separated for long, and they were married in 1967 in Washington, D.C.
Dr. Dorsen worked for the Public Health Service for 26 years. Then they moved to Riverdale (NYC) where Dr. Dorsen worked for the Albert Einstein College of Medicine and then went into private practice. During this time, he pursued his love of theater and worked in many theater productions and several movies including “Panic in the Streets” and “Tootsie.” Meanwhile, Gunilla attended the New York School of Design and subsequently helped refurbish a cruise ship. They traveled extensively, going to Sweden annually to visit her parents. In 1979, they took a 43-day train trip from London to Hong Kong. Then the Dorsens retired and moved to Sarasota. Sadly, Dr. Dorsen died at the Smith Care Center in 2009. 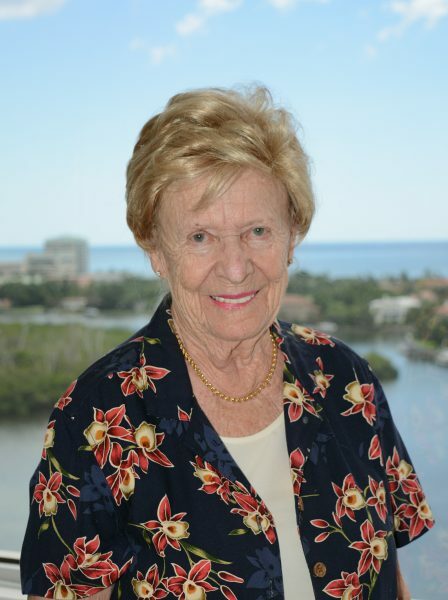 Gunilla was a volunteer for the Salvation Army and served on the board of Bay Plaza. When she is totally unpacked and has sold her condo, she wants to volunteer for the Fund Shop, to try Tai Chi and Yoga, and to participate in water aerobics and to play Mahjongg.